Before getting in to the review for Diablo III: Reaper of Souls - Ultimate Evil Edition, it's probably best if I just answer a few of the questions that are probably on a number of your minds right now. Diablo III: Reaper of Souls - Ultimate Evil Edition includes both the original Diablo III as well as the content that was released as part of the Reaper of Souls expansion on the PC. There's no real distinction here between the original content and the PC expansion content, though, so you're free to start your first game off with a Crusader class character and the new Act simply follows the original Acts and is indistinguishable from the others on the menu. 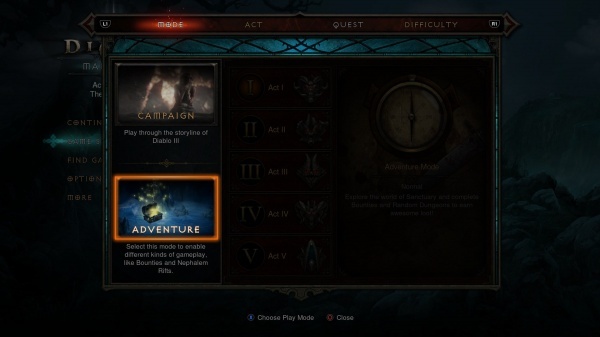 If you've played Diablo III on the PS3, then you'll have the option to import your characters into the Ultimate Evil Edition, but this doesn't extend to characters from the PC version of the game. The graphics look great and are comparable to the PC version of the game running at the same resolution on a good rig. And if you're concerned about how a mouse-driven, point and click game on the PC translates to a console then you don't have to worry - the interface has been overhauled to use a radial menu system and a new targeting system that lets you mow down legions of demons and the undead with nary a mouse click. Now that we've got that out of the way, let's take a look at the game itself. As the game opens, the village of New Tristram is under siege by the undead. A meteorite recently struck the great cathedral in Old Tristram, and ever since that event the dead have been rising from their graves to harass the living. That's where you come in. Your adventurer will arrive to help a city under siege by the dead, but your motivation for doing so will vary a bit depending on which character you've selected to play. While the gameplay is linear and the story remains the same on each play-through, each of the playable classes has their own motivations and backstory. When you play through the game with a different character, the conversations that you have with NPCs and your followers will reflect the personality and motivations of your character. There's a tremendous amount of lore in the game, most of which is disclosed from tomes you'll find on your adventures and through character conversations. While the main story will remain the same with each new game, the world won't quite be. 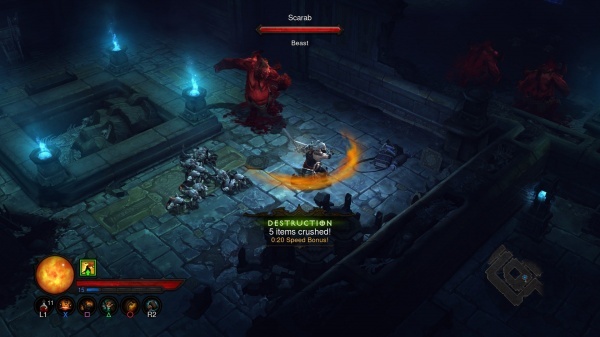 Diablo III randomizes its dungeons and outdoor environments for each new game. 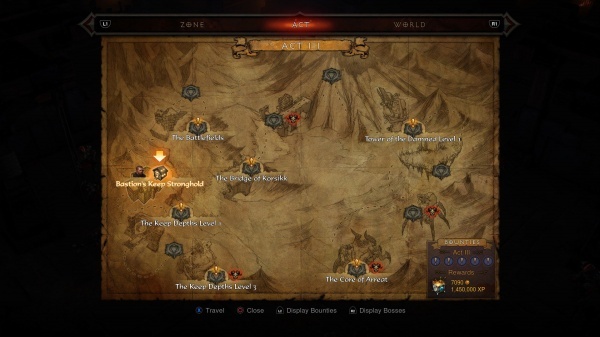 While games that randomize their environments can often create some odd architecture, that's not the case will Diablo III - the game manages to generate dungeons, castles, and caverns that appear as if they were all meticulously laid out by a skilled level designer. As for the characters themselves, there are six classes that you can choose from in the game. While you can't change their look, you can select to play any of them as male or female. The inability to craft the nose size or facial hair of your character is not anything that should be considered a knock against the game, though, as you'll make your way through so much looted armor in the game that that pretty face you spent time crafting will be hidden for much of the time and your character will continually don new looks as you play. The available classes in the game are barbarian, crusader, demon hunter, monk, witch doctor, and wizard. Each class lends itself to a certain play style, but the classes in the game don't really fit neatly into RPG archetypical roles. Each class has its own set of powers that draw upon unique sources of energy, and these powers can be further customized with runes that you will unlock as you reach higher levels. The character class powers are grouped into several different categories in which only power may be active at a time since the active power in each category is mapped to one of the controller buttons. There's no concept of skill trees here in that you do not have to commit to one power at the expense of another, and you are always free to take a moment and completely change your active powers among those that are accessible at your character's current level. This makes it easy to experiment with different combinations of powers, or to customize your power set for a particular encounter or for co-op over single player gameplay. And as you level-up more and more active and passive powers and power-enhancing runes become available, making for a staggering number of possible combinations. 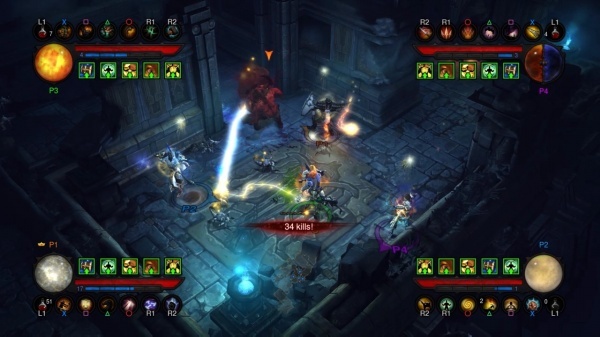 The gameplay itself is pure action-RPG, with hordes of enemies and plenty of loot. The point and click attacks of the PC version of the game have been replaced with a radial targeting system. As you move your character and change facing, you'll highlight the nearest enemy in that direction and your attacks, ranged or melee, will be directed at that target. The system works well and even though I have spent a lot more time clicking to kill in the PC version of Diablo III than in the console incarnation, I found the transition easy and the console system to be perfectly intuitive. In fact, once my characters started to reach higher levels and unlock new categories of powers, I found that it was easier to manage their arsenal of attacks using controller buttons than it is to spread your fingers across a number of hot keys on a computer keyboard. The interface overhaul extends to the inventory and skill screens as well. Gear is automatically sorted for you by type - helm, gloves, belt, etc. - and a radial menu lets you easily switch between these categories. 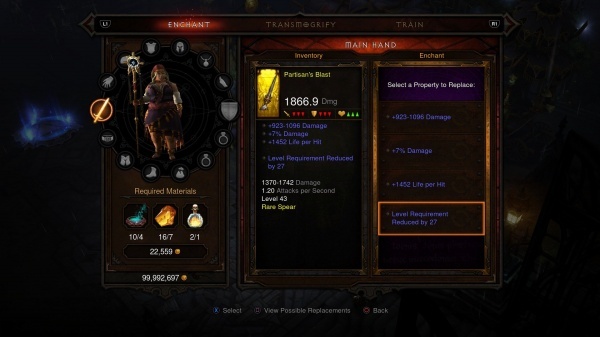 It's easy to compare your new loot to your current equipment to see if it offers an improvement, which is a good thing considering how much loot you'll accumulate during your adventures. Infinite town portal spells let you jump back to town to sell off excess loot or take it to the blacksmith to breakdown into crafting materials, and then port back to where you left off. Don't expect the game to provide a completely new and novel experience; at its core it's a classic action-RPG in the same style as has been around for years. What it is, though, is the ultimate evolution of the genre, bringing every innovation together and finely honing each one so that it all comes together to make for a finely crafted, and absolutely enjoyable, experience. There are hordes of enemies in the game, but each type has its own tactics and style of attack and there are variants of each that may have an additional power or are named champions that provide more challenge but award more loot when defeated. Killing sprees are rewarded with temporary boosts that can enhance your speed, attack rate, or even boost the experience you gain from slaying further foes. There is loot in the game, but here the amount of artwork dedicated to armor and weapons is amazing, magical weapons carry their own names, and a socket system lets you enhance your favorite pieces of armor and weapons to support your play style. The pet is replaced with followers in the game, NPCs that can join you in your quests. The Templar is a melee fighter, the Scoundrel a ranged attacker, and the Enchantress a spell-caster, and you're free to take anyone of them with you, although just one at a time. They are more than an additional adventurer to help you take down enemies, as each has their own personality and backstory. Their interactions with your character will depend on which class you are playing, and it is often fascinating to hear the conversations that take place between the two. For example, if you play as a crusader, the Templar will discuss the merits and differences between the two orders of holy warriors. There's a story to the game, but it's deeper than you'll find in most RPGs and the amount of world-building lore in the game is staggering, especially when you take into account that it's all original and not based on a long-running fantasy book series. I could keep going here, but there is so much to the game that I can't cover it all in a review and keep that review at a reasonable length. Suffice it to say that the game is the most full-featured and well-designed action-RPG that I've ever played, and I've played a lot of them. Once you make your way through the game's campaign, there are more opportunities to continue playing beyond experiencing the game again with a different character (although I have to say that doing that is highly recommended). Co-op play is possible with up to four total players, and you can open your game to friends or the public at large at any time you want a little help or just want to enjoy some company. The game will automatically boost the stats of lower level characters to match that of the highest, so there's no need to worry about looking for friends with the same level character as yours. You may even involve your friends in your game while you're playing alone - lose a battle to a monster and that monster can spawn into the game of someone on your friends list. This nemesis monster will keep working its way through friends lists until defeated. If you'd rather fight your friends than help them, a brawling arena is provided for PvP play, but these fights are strictly for bragging rights. If you'd rather continue the experience on your own, beating the game the first time opens the Adventure Mode. This mode unlocks the entire game world, removing all story events and other barriers to roaming free across the world. In addition to seeking out more enemies to fight and loot to gain, you can take on bounty missions that have specific goals such as killing a powerful monster or clearing an area and special rewards. Nephalem Rifts lead to randomly generated levels that can feature any combination of terrain and enemies. Each rift is protected by a Rift Guardian and defeating one will reward you with epic loot. At this point I should probably wrap things up so that you can run out and pick up a copy of the game. 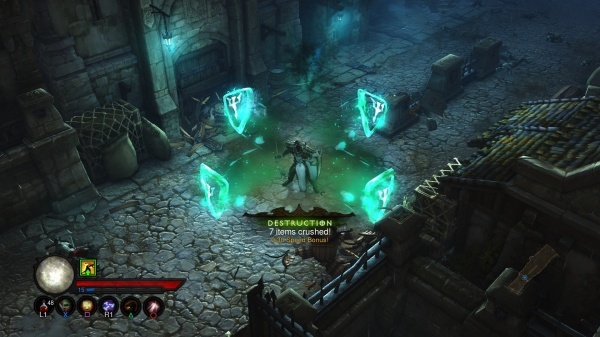 Diablo III: Reaper of Souls - Ultimate Evil Edition takes everything that's great about action-RPGs and makes it better. There is so much packed into the game and it has such a high replay factor that you'll be enjoying it for a long time to come. Final Rating: 95%. The ultimate action-RPG.